BUFFALO, N.Y. (AP) Keith Yandle and the Florida Panthers took advantage of the undisciplined Buffalo Sabres in the first period. And then the Panthers stood their ground once things got chippy in the final two minutes. Yandle scored a goal and had two assists, and Harri Sateri stopped the final 19 shots he faced – and 30 overall – in a 4-2 victory in a game that finished with officials issuing four major penalties – three to Sabres players – on Thursday night. The Panthers scored three times – including two power-play goals – in a span of 7 minutes, 5 seconds to build a 3-1 lead in the first period. Then emotions began flaring once Colton Sceviour sealed the win by sneaking in a backhand shot with 2:24 remaining in the third. The most serious scuffle involved Buffalo forward Johann Larsson, who was issued a 10-minute match penalty and 5-minute major for cross-checking Vincent Trocheck across the face with 35 seconds left. Larsson’s hit came after Trocheck slashed Buffalo defenseman Jake McCabe at the Florida blue line. Some 90 seconds earlier, Sabres forward Evander Kane was issued a major penalty for interference for his blindside hit on Aleksander Barkov just inside Buffalo’s blue line. Barkov had just released a pass and was pushed back by a hit from Buffalo’s Marco Scandella, before being immediately bowled over by Kane, who was following the play. Kane was then confronted by Florida’s Nick Bjugstad with the two exchanging punches in the corner. Kane defended himself by saying he couldn’t have avoided Barkov, who was already falling backward. ”I didn’t really see them,” Kane said. Larsson said he doesn’t believe he did anything to justify the match penalty, even though replays showed him striking Trocheck in the face. ”The guy came right at me and I pushed him a little bit,” Larsson said, who faces a one-game misconduct pending an NHL review on Friday. Trocheck was not penalized for his slash on McCabe. McCabe was issued a 5-minute fighting major, as was Panthers defenseman Alexander Petrovic. Florida forward Micheal Haley then picked up a 10-minute misconduct for sparking a scuffle in front of the Buffalo net with 3 seconds left. Mike Matheson and Denis Malgin also scored for the Panthers, who won consecutive games for the first time since winning five in a row from Dec. 19-30. Sateri, a 28-year-old NHL rookie, won his second career game with starter Roberto Luongo and backup James Reimer both sidelined with lower-body injuries. Ryan O’Reilly and Zemgus Girgensons scored, and Chad Johnson stopped 28 shots for a Sabres team that continues to struggle at home. Buffalo ranks last in the Eastern Conference standings and dropped to 6-14-3 at home after entering the day tied with Arizona with the NHL’s fewest home wins. 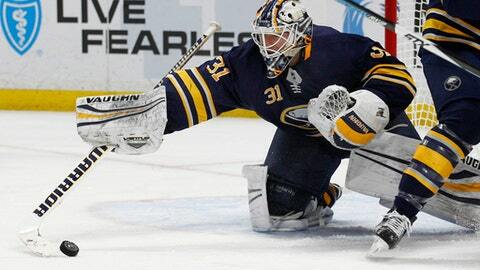 The Sabres blamed themselves for four penalties that led to two of Florida’s three first-period goals. That included Yandle tying the game by scoring during a two-man advantage at the 11:06 mark by one-timing in Barkov’s feed into the right circle. Missed scoring chances didn’t help Buffalo either. Kane, O’Reilly and Kyle Okposo all had shots that missed the net from in close. NOTES: Reimer took part in the team’s morning skate, but missed his third consecutive game with a lower-body injury. … Sabres C Jacob Josefson returned after missing seven games with a lower body injury. … Barkov played in his 300th career game. Panthers: open three-game homestand against Detroit on Saturday. Sabres: continue five-game homestand against St. Louis on Saturday.